It is that time of year again. Today you will find me at the University of California, Los Angeles campus where the annual Los Angeles Times Festival of Books is being held. I am thrilled to be able to go again. This year, my husband and I will be meeting up with several fellow book bloggers from the area (and a couple from out of state). I am both nervous and excited. Anjin and I decided to go light on the author panels this year. We hope to take our time and look around more leisurely as opposed to watching the clock and racing around the campus like we usually do in order to get a good place in line. That means we may have less time to sneak in a moment of reading though. I have been saying I needed to settle in and check my challenge progress for a couple of months now. Well, I am finally getting around to it. It could be worse. And, yes, it could be a lot better. That darn life thing! Always getting in the way! Let's take a peek at my progress, shall we? No challenges completed; but then, I am not one of those industrious bloggers who plows through challenge lists in hopes of finishing them a month in. I like to spread the books out and draw the challenges out for as long as I can. That's half true, anyway. While some challenges will be wrapping up sooner then others, many still have months to go. I haven't given up hope on any of them yet. I actually feel more confident about them than I did last year--and I was signed up for quite a few less then. For me, it is all about having fun in the process and that's exactly what I am doing--having fun. Enjoy the festival Wendy. Be sure and tell us all about it. Good luck with the challenges and have a great weekend! Festival of Books sounds great. Enjoy your time. It would be so much fun to meet fellow bloggers. I'm so jealous of all the book bloggers that are going to the book festival!! But seriously, HAVE FUN!! I'll be looking forward to hearing about your wonderful time! Wasn't Natasha Maw coming to that festival? I am also jealous for many reasons...books, other bloggers, something different to do! I can't wait for an update after its over. Now as far as your challenges are concerned, you've got so many of them! If you add up all the ones you've read, it would be more than the ones I've read, and I only have a few. I went light this year. I wanted to see what was a reasonable amount. If I make my goals, I will ratchet it up next year! You got an award waiting :) please pick it up here .. I hope you have a wonderful time at the Festival of Books! If I don't try and plow through some of my challenges in the beginning, I find that it becomes an out of sight, out of mind problem! Kristy - Thank you! It's going to be fun. I saved my Christmas money so I wouldn't come home empty handed. Not that I actually need more books . . .
Eliza - Thanks! This will be my first time meeting bloggers. Stephanie - I was surprised at how many of us will be there too. Ten or eleven, I think! It's like a reunion--only we've never met before. At least most of us haven't. Jill - It should be fun. :-) I'm trying to decide now what to wear. Los Angeles is a bit cooler than where I live. It's been so warm lately, but I think it's supposed to be cooler today. Sandy - Yes, Natasha (Maw Books) and Jen (Jen's Book Thoughts) are coming from out of state. Isn't that great? Most of us, if not all, are planning to meet up for dinner tonight. Should be fun! I should have gone light with the challenges, but I had so much fun thinking of all the books I could read for them. It looks like I've read a lot, but the truth is I haven't read much at all this year. I have a lot of crossover books. Desert Rose - Thank you so much for the award! Vasilly - Thanks! I'm going through my mental checklist to make sure I have everything I need before we hit the road. Kathy - Thank you! I hope so too! I'm about to go and make sure hubby is awake. It's about an hour and a half to two hour drive from where we live to the campus. Hopefully there won't be much in the way of traffic. I prefer to pace myself with the challenges so I can read other books in between the challenge ones. I can see why so many (like you) prefer to race through them though. And if it's a method that works for you, then it's the best one for you, right? Hope you have a WONDERFUL weekend. I wish so much I could have made it down to LA for the festival...maybe next year! I think you're doing great with challenges, Wendycat. Better than I am! If reading ever becomes a chore then you know you need to do something else!! I'm with you...I read for fun, pleasure, a chance to escape the everyday and be someone else for a while, and to be somewhere else too!! Have fun this weekend!! Have fun at the book festival! I'm completely challenge-free, now. You're doing great with your challenges! I could never have balanced so many at once. I'm so jealous! I would love to be able to go to the festival. You're doing fine on your challenges, and it's quite brave to lay it all out for everyone to see like this. ;) I'm not sure I'm brave enough for that. Oh the Festival sounds awesome! Have fun!!! Lezlie - Lots and lots of time! ;-) And if I don't finish, that's okay. It's about having fun, right? Wendy - It's been great so far. I wish you could have come too, Wendy. I thought about you! Staci - Exactly! I don't want to reading to ever feel like a chore. I hope you are having a good weekend too! Laura - Thank you! I'm sure trying with the challenges. I just haven't been able to read as much as I would like. We had a great time at the festival. I'm looking forward to going back tomorrow. Nancy - Thanks! I'm probably crazy for trying to juggle so many at once, but I've been told many times over I'm an overachiever. :-) Can't let those believers down. Haha! Lisa - I would love to have met you. One day we'll get you here! I nearly didn't post my challenge progress report. 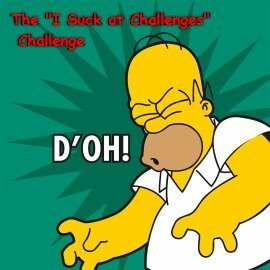 It is kind of embarrassing how many challenges I have going on right now. Jen - Thank you! The first day was awesome. I had such a fun time meeting with the others who were able to go. The festival sounds like a lot of fun! You look like you're doing well with your challenges to me. The festival sounds like a lot of fun! I hope you and your husband have a great time there! Wendy...Haven't talked in a while...have fun at the festival. I am afraid to look at my challenges. I think I forgot what my challenges were. Good reminder...thanks. I'm always so late to response - sorry! Since you posted this 2 days ago, how was the festival? Did you buy books? Lucky you - a festival and getting to meet book bloggers! Hope you had tons of fun. I was able to browse at some pictures from your visit to the festival since reading your other post and can I tell you how jealous I am! I'm both scared and excited about the possibility of one day meeting other bloggers--you guys have become such a part of my life. Melody - It was a lot of fun. I'm so worn out now too. Donna - I haven't been able to get around much lately and I feel terrible about that. Stacy - I did have a great time. It was over all too fast. Nymeth - Maybe one year you will find yourself in California around the end of April and you can come too! We can dream, right? Iliana - I had a great time and it looks like my sunburn is turning into a tan. Whew! Joy - Aren't I? There are advantages to living where I do. :-) Not the traffic though. That's a distinct disadvantage. Trish - I was really nervous about meeting everyone and almost talked myself out of going. I'm so glad I did go though. Everyone really was much like they present on their blogs which made things so much easier. It did seem like I was meeting people who I'd already met before. I just read your Festival of Books post and it sounds like such fun. I wish there was some kind of book event I could go to, but I'll just have to dream for now. Nat - Maybe someday you will be able to attend a book fair or festival. Maybe even the LA Times Festival of Books!